Goldstriker International, a company which specializes in dipping mobile phones ingold and platinum, appears to have snatched the title of world’s most expensive mobile phone from the iPhone 3G King’s Button with the creation of the iPhone 3GS Supreme. Priced at £1.92 million (approx. 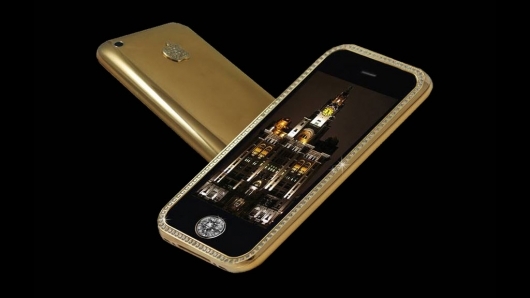 US$3.14 million at time of publication) this is one phone you definitely wouldn’t want to leave on a bus. The extravagant (read ludicrously expensive) phone was designed by Stuart Hughes of Liverpool, England and was ten months in the making. The whole casing was created with 271 grams of 22ct solid gold, while the front bezel houses 136 flawless diamonds, which total to a massive 68cts. The rear logo in solid gold has 53 flawless diamonds amounting to 1ct and the front navigation button is home to a single cut very rare diamond at 7.1cts. And where does one keep such a phone? Why in a 7kg chest made from a single block of Granite, offset with Kashmir gold and with Nubuck top grain leather inner lining. Before you go reaching for your Titanium credit card, you should know the iPhone 3GS Supreme was commissioned by an anonymous Australian businessman from the gold mining industry, who is obviously benefiting nicely from the current soaring gold price thank you very much. If you want something similar you’ll just have to contact Goldstriker International and commission your own. Just remember to leave your conscience at the door.